Yokogawa Electric Corporation (TOKYO: 6841) announces that it has developed a cavitation*1 detection system and will be releasing it for sale on January 31. By detecting cavitation, quantifying information on this, and displaying this data in real time, this system provides an early indication of conditions that can result in a degradation in pump performance. By detecting problems early on, before damage occurs that can cause an increase in both vibration and noise levels, this solution improves the efficiency of plant maintenance. Cavitation in fluids can cause damage to pumps. To minimize this damage, it is necessary to detect cavitation at an early stage and take corrective measures such as adjusting the flow rate. One issue, however, is that there has been no way to quantify cavitation. In addition, since cavitation occurs inside equipment, it is impossible to visually check whether this is occurring. Cavitation is usually detected by field personnel who rely on know-how gained on the job to detect changes in vibration and noise levels that are caused by excessive cavitation. However, even highly experienced plant personnel and specialists can miss these early signs, and such problems may go undetected until the inevitable increase in vibration and noise occur. 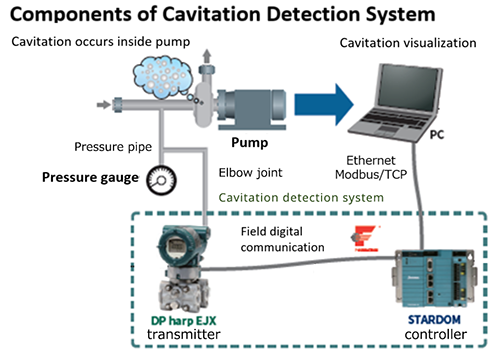 In its analysis of this problem, Yokogawa focused on the principle that there is a direct relationship between differential pressure and cavitation, and in the end was able to come up with a solution that involves the quantification of cavitation based on pressure data. The system that Yokogawa developed consists of a STARDOM™ FCN-500 network-based control system, a Yokogawa cavitation detection logic program, and a highly accurate (±0.075%) DPharp EJX110A differential pressure transmitter, and relies on the FOUNDATION™ Fieldbus industrial digital communication standard to link these components. At 100 ms intervals*2, the DPharp transmitter measures the pressure inside the target equipment, and this data is transmitted via the fieldbus network to the STARDOM FCN-500 system for processing in real time by the logic program. This system is thus able to detect cavitation issues early on, enabling field personnel to take quick remedial action by, for example, reducing the flow rate to a level that suppresses cavitation without interfering with production line operations. Note: There is no universal indicator for the extent of cavitation and these are only rough descriptions of the different levels of cavitation. Valves, pumps, and other types of plant equipment can all experience problems such as cavitation that are caused by anything from the opening/closing of a valve, a change in viscosity level or some other physical property of a liquid, or a change in the external environment. Field personnel have conventionally relied on their own know-how and the use of analytical tools to find out what is causing these problems. Thanks to the development of this new system, field personnel will now have a tool that will help them troubleshoot problems with greater efficiency by identifying and quantifying cavitation in plant equipment. *1 A physical phenomenon whereby the differential pressure of a liquid in a pump or some other kind of plant equipment causes bubbles to rapidly form and then burst. The shock produced by the bursting of the bubbles damages the equipment. *2 Outputs pressure data every few seconds to a control system for monitoring and control. The transmitter stores in its internal memory pressure data that is collected at 100 ms intervals. Oil, petrochemicals, chemicals, iron and steel, pulp and paper, water supply and wastewater treatment pharmaceuticals, food, etc. OpreX is the comprehensive brand for Yokogawa's industrial automation (IA) and control business. The OpreX name stands for excellence in the technologies and solutions that Yokogawa cultivates through the co-creation of value with its customers, and encompasses the entire range of Yokogawa's IA products, services, and solutions. This brand comprises the following five categories: OpreX Transformation, OpreX Control, OpreX Measurement, OpreX Execution, and OpreX Lifecycle. The real-time cavitation detection system is an OpreX Asset Management and Integrity family solution in the OpreX Transformation category, which delivers operational excellence throughout an enterprise's activities, from production through to supply chain optimization and risk and business management.